Little has come down to us throughout the ages about Severina other than her fairly extensive series of coinage. The evidence suggests that she was a major influence in her husband’s life particularly so since she was honored by Aurelian on almost every denomination issued by the mints in both the West and Eastern provinces. 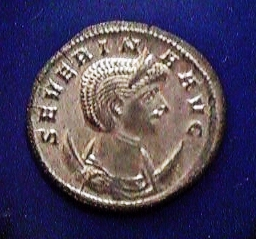 The coinage of Severina adheres to the same reforms as that of her husband, Aurelian. The antoninianii were standardized and marked typically with XXI or KA and denominations of the denarius, sesterius and as were restored.